An egg also includes 5 % of your daily value of iron and vitamin A. Remember the yolk is the nutrient sack to help the chicken embryo grow into a chick. There's a lot of good stuff in there. Since I buy and eat a lot of eggs, I don't just buy any brand. My favorite brand was a local farm that my supermarket stocked. I paid $3.49 for a dozen of the most fresh and lovely eggs that I have ever eaten. Then something sad happened. This local farm decided to close because they couldn't keep up with the latest federal government regulations regarding eggs. Yes, I almost drove down to Washington, DC to strangle those turkeys for messing with my eggs. I found myself buying the supermarket brand of eggs because that was all the store had stocked. Was I concerned about the quality of the $2 per dozen eggs? A little, but what I found was truly disturbing. I decided one Sunday morning to make my family some soft boiled eggs and I only had the supermarket brand. As I put them in the water, they cracked. All of them! The shell wasn't hard enough to hold the egg together when it hit the simmering water. Then, I tried to serve them and they tasted like, well, sulfurous crap. They were inedible - the inedible egg. And, yes, I was mad! Where were my lovely eggs? I decided to drive to the store and throw them at the store windows. No, I didn't do that - but I did dream about it for a couple of seconds. I didn't realize until I tried the cheaper generic eggs that I had not only been paying for LOCAL but I had been paying for a quite superior product. What did they feed these chickens at the supermarket farm? Clearly it wasn't the same food they were serving at the local farm. The factory farm that produced the supermarket egg may have saved me money - but is that savings worth it? The quality of feed for ithe chickens and how they are treated is important to the end product. I don't think making a cheap egg is a great idea. Hey, I like a deal but this isn't where I am going to cut costs. And, now, you are going to ask me which eggs are the best, organic? cage free? omega-3? etc. etc. I believe I am spoiled because I have found another local egg farm and their eggs are great. The yolks are orange, they aren't watery, and they taste divine. If you can find local eggs that cost a bit more and fulfill the above requirements, you are going to do well. I live in the middle of nowhere (near farms) so I can find great eggs. Where do you find great eggs? Do you find cheap eggs to be a problem? Lol! What a great post! This is hilarious. I love farm fresh eggs, they do taste the best! Check out organic, thats the closest you will get. Also try a brand in the supermarket, if yours has one, that is local farm eggs. Even egglands eggs are mid range price and they are ok. As for the dropping the eggs in hot water..LOL! That happens anytime...I usually put the eggs in first, then boil. If I drop them in the eggs usually break! Eggs are, unfortunately, like a lot of foods in that it's hard to know what you're getting at the supermarket. Sure, the lowest priced ones are a good deal--at least on face value--but you have to wonder what other types of costs you're incurring when buying them. I do buy my eggs at the supermarket, although I pay a little more and get the eggs from cage-free, naturally raised chickens. You can tell they're better quality. I just hope the marketing is a true. Part of the reason we mostly eat vegan in our house is because we really don't have any idea what's happening to our eggs (also, I don't want to be THAT person looking at every single cheese label for "rennet"). We can sometimes get fresh eggs, Columbus is actually pretty farm friendly for a city, but we have some trouble in the winter months. The best we can do is look for eggs that say, "cage free," "organic," and "vegetarian fed," because we hope those chickens are being treated just a teensy bit better. BUT, it is completely legal to keep chickens in Columbus proper, so we're actually looking into that. I just read last week that chickens who are allowed to be free and peck at the ground produce harder shelled eggs because they are ingesting silicon from the dirt which transmutes into calcium which makes the shell hard. I imagine the poor chickens who produce thin shelled eggs are warehoused and not free. I always lower eggs into boiling water. A good fresh egg can take it! My green-thumbed grandmother used to use crushed egg shells to fertilize her plants. Another great post, Snack Girl! 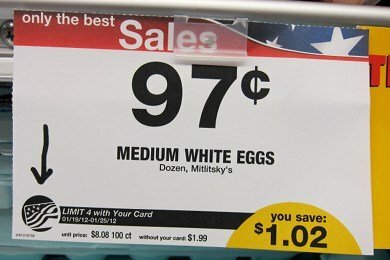 I too have always been suspicious of "clearance eggs" and have avoided them. Freshness is always something I'll pay more for! I buy the Eggland's Best eggs. I tried to switch to store brands, but found exactly as you: thin shells, watery yolks, & they taste terrible! I do nuy local in the summer when the farmer's marketis open. "They were inedible - the inedible egg." I only buy Egglands Best! feeding AND care of the chickens and the farmer's pride of product. We support the farmers who sells the freshest and best produce! 2. If that's not possible, I look for Nueske's eggs or Trader Joe's cage free organic eggs (always brown eggs...our personal preference.) We have never yet had a bad experience with either brands. 3. Start eggs in COLD water and bring to a boil. That should help alot with cracking: a tip from my grandmother. I also bought an egg timer, which you put directly in the cold water with the eggs for eggs cooked perfectly just as you'd like them! 4. Throw out those cheap foul-smelling eggs and never be tempted to buy them again! Great post this morning. thnx! I like Egglands Best too,and they don't cost much more than store brand. Publix brand is pretty good for store brand. Is there any real difference between brown eggs and white eggs as far as nutrition and taste? I've always just stuck to white for the most part but it is my understanding that the only real difference is that the darker feathered chickend lay brown eggs while white chickens lay the white ones. I could be mistaken though. We have chickens. Their eggs are better than store bought, but I like store eggs, too. My husband is awesome and takes care of the chickens even though we were both raised in the city. How lucky I am!!! Funny, I had just started to think about this very issue. I used to hate eggs (!) But grew out of that recently. Now I eat an egg almost every day and, while that means I'd like to cut costs (I'm a grad student), it also means that this is a substance that I'm regularly putting in my body. Thanks for tipping the scales on my decision! It's the only egg we allow in our house. Love the newsletter and the philosophy of the company owners. Plus, it's a MA based chicken egg farm which I love! P.S. Why do all of you buy Egglands? It's a Styrofoam container and that's pretty crappy!!!!! I prefer to buy an egg that comes in cardboard. I think a big part has to do with age. The cheaper eggs are grown at a big farm somewhere in who knows where, they process them, send them to a warehouse by truck where the warehouse processes them, that sends them to the supermarket once a week, or even worse if it's a national chain to the warehouse of the store that distributes them, then they sit in the back room until shelves get low. By the time you get them they are a week old, then you put them in your frige for a couple days. Local ones cut out the middle men, they go from farm to shelf within a couple of days. Isn't Egglands Best just another factory farm? I'm going to have to google that. In the summer months we get lovely farm fresh eggs from our CSA box (only $30 for the whole season to get a dozen eggs included!). We can visit the farm and see the chickens roaming. Unfortunately in the winter months I usually rely on the supermarket...I try to buy Organic Valley and only use them sparingly. Have you read "Eating Animals" by Jonathon Safran Foer? I'm an omnivore and found this a fascinating and disturbing read about animal farming in the US. It's worth the read. Egglands Best are pretty good as far as supermarket eggs go. I'm looking for a local supplier myself. Also, no difference between brown and white eggs. White eggs come from white feathered chickens, brown eggs from brown/red feathered chickens. No difference in the nutriet value at all.....brown are more expensive sometimes because that type of hen normally eats more food! I buy local eggs from a farmer near my home. You can actually find where to buy them from in your area by visiting localharvest.org. Many farmers markets have farmers selling their eggs too. It's not just because of the nutrition or superior quality of the egg that drives me to seek these out, although that's a huge part of it. I can't stomach thinking about those chickens that live in quarters so cramped that their beaks must be cut off so they dont peck one another to death - just so 97 cent/dozen eggs can exist! I prefer to vote with my food dollars for better treatment of animals whenever I can. :) It's healthier for them, and it's healthier for my family.